Ski Park HD is an iPhone game developed by RagCat Games. 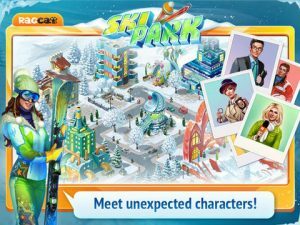 If you love to go skiing, but are stuck in a warm climate, this fun little game captures a lot of the fun you can have at a ski resort! Starting off with a run-down little resort town, you can build hotels and chalets to help rejuvenate the local economy. If you love city building games, this is a fun twist on the usual look of games in this genre. But there’s more to Ski Park HD than meets the eye. This game also includes some “hidden object” elements, which elevates this game into something truly special. 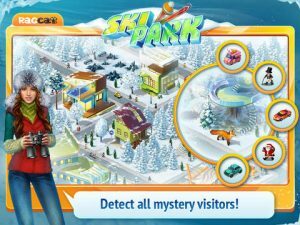 There are tons of tasks, buildings, and interesting characters to help you stay active on your mountain hideaway. There’s always something to do, which is great! 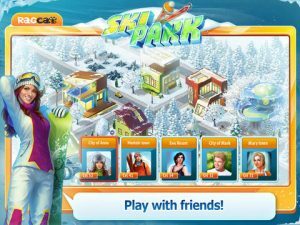 The biggest beef I had with Ski Park HD was the VERY long time it took for the game to “update” the first time I started to play around with it. It took several minutes, and it really cooled my desire to get playing. I also took issue with some of the in-game, on-screen text. On an iPhone 4S screen, a lot of the text was very small! Readable, yes, but VERY small! The tutorial also felt a bit long-winded. That being said, this game is still very entertaining. 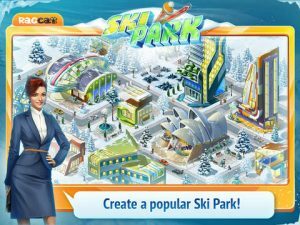 If you’re a big fan of SimCity games or the large city-building game library of Kairosoft, Ski Park HD is a fun building game. Ski Park HDis compatible with iPad 2 Wi-Fi, iPad 2 Wi-Fi + 3G, iPad (3rd generation), iPad Wi-Fi + 4G, iPad (4th generation), iPad Wi-Fi + Cellular (4th generation), iPad mini and iPad mini Wi-Fi + Cellular. Requires iOS 4.3 or later. Ski Park HD is also available for Android devices. Click here to learn more about this game on Google Play!